The other day I watched a great video here, on a method of curling your hair overnight. I remember my mom making ringlets in my hair, by tying strips of cloth in my hair and wrapping damp hair around them. This method is similar but far less time consuming. I thought it would be fun to quickly illustrate the video in a few steps. If you are confused, pop over and watch the video too. 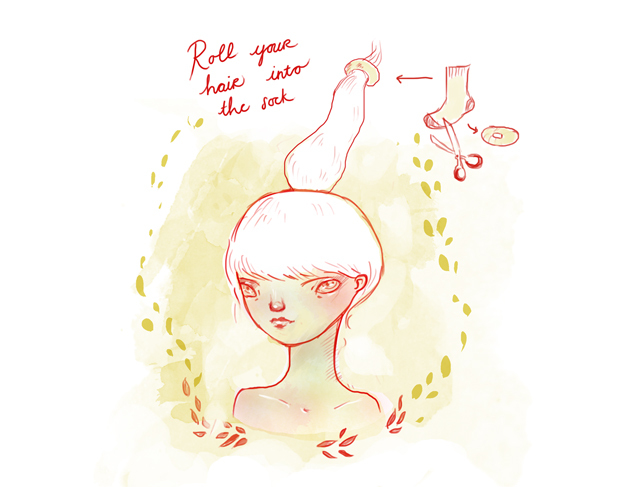 The guide shows you how to make a roll bun with a sock donut, which is also a fun way to wear your hair. The final result are lovely soft curls in the ends of your hair. First step is easy. Make a high pony tail on the top of your head. Lightly spritz your pony tail with water, so that it is slightly damp. To make the sock donut (for the bun) cut the toes off and roll into a ring. Place your pony tail through the sock ring. Tuck the end strands over and under the sock ring. Continue rolling the sock down your pony, all the while tucking your hair over and under. A nice ring bun should start forming. Your hair should cover the entire sock. It takes a little practice to roll all the hair evenly over the sock. You can put another elastic around the bun on the top of your head, when all the hair in the pony tail has been rolled into the sock bun. This will hold it in place, but you will find it is quite managable. That’s it! 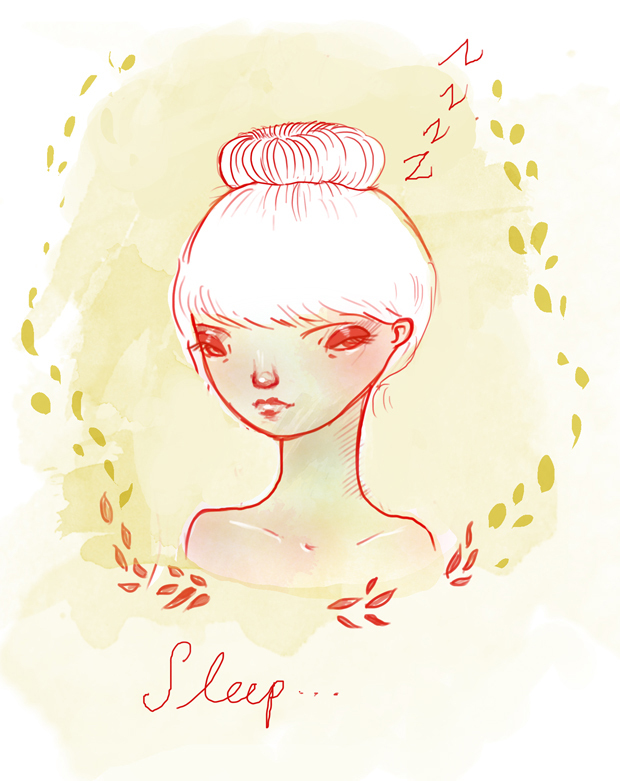 Now all you need to do is climb into bed and dream sweet dreams until morning. Your hair should dry overnight into the curls. When you wake up, gently unroll the bun, and remove all the hair elastics. Your hair should unravel into lovely princess style curls, now you can just brush the top gently, or use your fingers to arrange your hair… Ta-daaaa! Note: different hair thickness requires different amounts of dampness, so just try experimenting to see what your hair needs. My hair is really thick, and it worked fine. 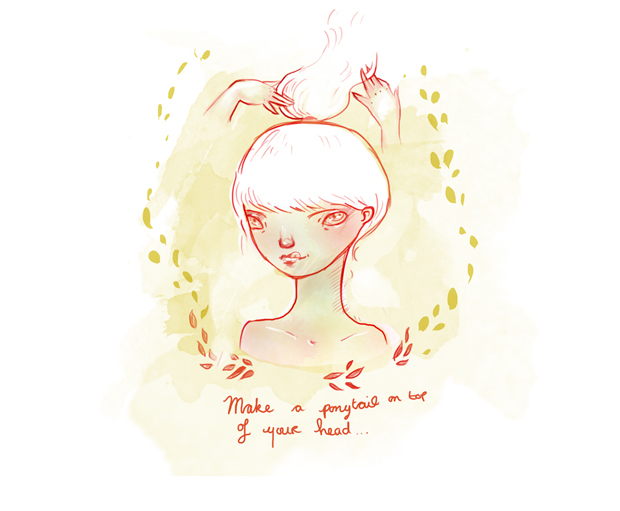 I think if your hair is thinner, it may even work better. Make sure your hair is combed well before you start the process, so that the curls are smooth. 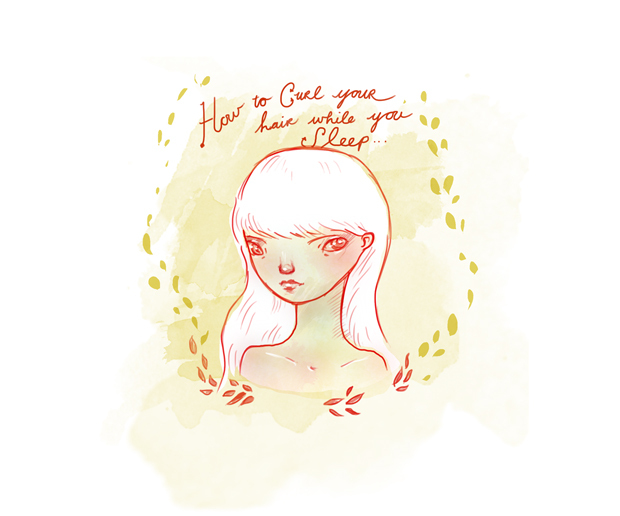 You can see my other illustrated hair guide here. 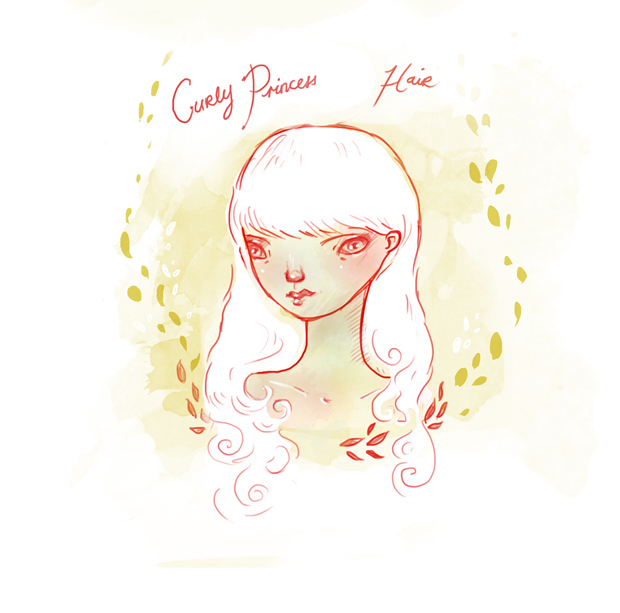 Tags: DIY, how to curl your hair overnight, illustrated guides, illustration, kat cameron, loepsie, no heat hair curling. Bookmark the permalink. thanks, ill check back often, have bookmarked you for now. Perhaps your hair type is different to mine? I found if my hair was too wet, it did not work as well. Perhaps you could try with a mixture of hairspray & mist? Good Luck!